Shun Chuan Precision Machinery Co., Ltd.
•All models with one piece solid stand. •All models with universal feed gearbox & reversable apron. 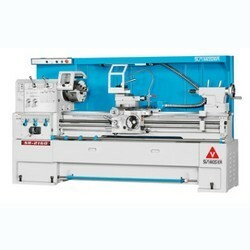 •All models with 80mm (3.149") spindle bore, ASA D1-8. •All models cross slide is hardened and ground to prolong operation life. •All castings are properly stabilized and stress relieved. •Bed ways are hardened & ground to min. HS-70. •Turcite B coating between the bed and carriage. •Built-in coolant pump & fitting provided. •Wider bed way which give absorbs vibration. 12 steps / 30~1500 R.P.M. 45 Kinds / 2~72 T.P.I. 21 Kinds / 8~44 D.P. 18 Kinds / 0.3~3.5 M.P.